Want to write an outstanding résumé or curriculum vitae (CV)? Make sure you look over the six hints listed below to give your CV the best chance of getting you a job, client, interview, or other position or experience. What's the best thing you can do to make your CV stand out? Tell the truth. Believe it or not, one of the biggest problems with most CVs is that they contain misinformation or outright lies. In fact, people have fibbed for so long on their CVs that employers have started to become jaded about the accuracy of all CVs. Remember that if you say you can do or have accomplished something, you should be able to support your claim. If you can't, it doesn't belong in your CV. It's fine to say that you increased sales, but it's better to say that you increased sales by 42.5% over a seven-month period in 2002. By being as specific as possible, you're offering relevant data to whomever is reading your CV, and your document will greatly stand out as a result. You'll also be positioning yourself apart from your competition because you're providing very measurable data. 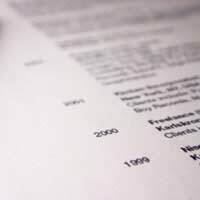 Though the days of the "stick to one-page" CV rule are over, it's still best to keep your CV to a minimum. If you can organise the same basic information in two pages rather than three or four, you absolutely should. After all, it's easier for someone to quickly scan a short document than a long one. Creative borders, ornate font types, and computer-generated graphics may be appropriate for some PowerPoint presentations, but they don't belong in a professional CV. Unfortunately, some individuals believe that the more ornate their CV is, the more likely it will be to stand out. This assumption is false. Though their flowery CV might indeed catch someone's eye, it probably won't be for the right reasons. Stick with one type of font type (and always have at least an 11-pt font) and emphasize bullet points or headers using basic formatting options, such as bold typefaces and italics. If you're having difficulty putting together a CV, don't hesitate to ask a trusted friend or colleague to assist you. After all, as the old adage goes, "two heads are better than one." Often, you may have forgotten about a specific accomplishment or achievement that occurred some time ago and your friend may be kind enough to remind you of it. You may even want to invest in a CV writing firm if you feel that you simply cannot put together a document that will open doors. If you choose this option, make sure you check out the company carefully; the Internet has made it very easy for anyone to call him- or herself an "expert". Make sure whomever you hire can back up their claims; furthermore, ask for a CV sample and referrals before agreeing to have someone else write your CV on your behalf. Your CV is one place where you're allowed to boast, at least a little. After all, a good CV is really nothing short of a sales piece; in essence, you're "positioning" yourself in a favorable light so that your recipient takes some kind of action as a result of reading the CV. Thus, it's all right to sound proud of your accomplishments; just make sure you don't come across as too long-winded, overconfident, or conceited. Again, this is a time when a good friend can provide you with insight as to any adjustments you need to make. By being a little proactive and doing your homework, you'll be able to put together a CV that is honest, unique, and interesting.